Our solar tracking controllers are in use in over 20 countries, some of our clients include IBM , Entech Solar, BrightLeaf, and hundreds of DIY solar enthusiast around the world who are moving the solar energy industry forward at the grass roots level. Our solar tracking electronics provide a cost effective solution for the utility scale developer designing a high accuracy solar concentrating collector to the back yard experimenter converting an old satellite dish to a PV tracker to get the most effeciency from their solar panels. â€¢ Dual Axis, Single Axis, or Twin Single Axis closed loop solar tracking with better than 1/4 degree accuracy. â€¢ Dark Return function to position solar collector or solar panel array back to the East at the end of each day. â€¢ Two programmable park directions for stowing the solar collector in a variety of positions during faults or alarms. â€¢ Drive Off Sun function for moving solar collector away from the sun if the solar collector is overheating. â€¢ Load Sequencing mode insures that only one actuator operates at a time reducing power supply requirements. â€¢ Manual actuation buttons on the controller PCB for manual control of the solar tracking collector. â€¢ Tracking Delay is programmable from one second to 20 minutes for high accuracy or reduced actuator wear. â€¢ 4 amp output drivers can power a wide range of DC actuators, relays or hydraulic solenoids. â€¢ Output bridging mode provides increased power when using controller for Single Axis solar tracking. For more information about our solar tracking controllers please visit our Products Page. Solar Heliostat: A solar tracking device capable of reflecting sunshine in a constant direction throughout the day. We build solar heliostats that are guided by dual axis optical solar tracking electronics. The analog solar tracking circuit controls two mechanical actuators that move a mirror plane in two axes. The mirror plane will reflect the sun to a stationary target during the day and then return to a preset morning position after sunset. The tracking electronics are capable of tracking the sun with sub degree accuracy. This heliostat has nine 1' sq programmable mirrors delivering 9X concentrated solar power (CSP) to a fixed target. The sun delivers approximately 1000 watts/m2 so a one sq-ft mirror can be expected to redirect around 80 watts of power after reflective losses. This heliostat can direct around 700 watts of CSP to a 1 square foot target. This energy can be used for heating, lighting and electric generation. Our Heliostat kits start at $2500, this does not include stand or mirror. A heliostat kit with a stand is $3000. We are working to bring this price down but rotary actuators are still rare and very expensive. The rotary actuator we prefer to use for our heliostats cost about $800. We do not include the mirror because it costs more to package and ship it than it does to buy it locally. We suggest 1/4" glass mirror with safety backing. 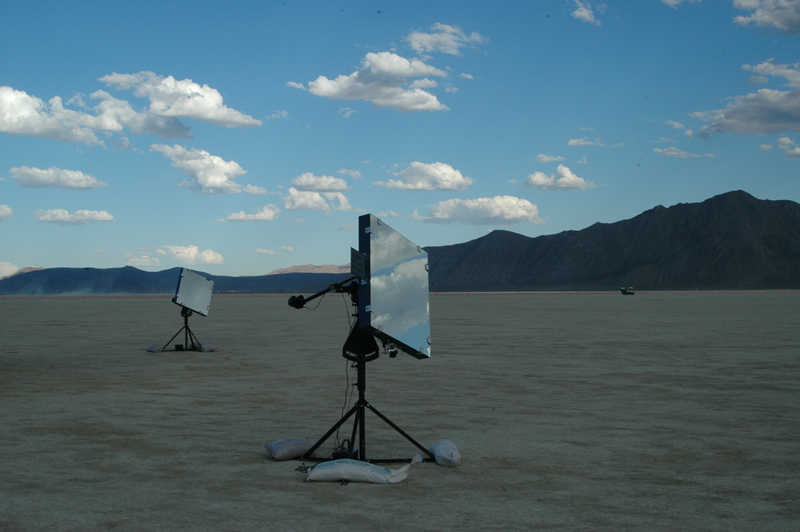 Two of our 1 meter single mirror Heliostats traveled to Burning Man 2007 as part of The Sacred Water Temple theme camp presented by the Museum of Outdoor Arts. 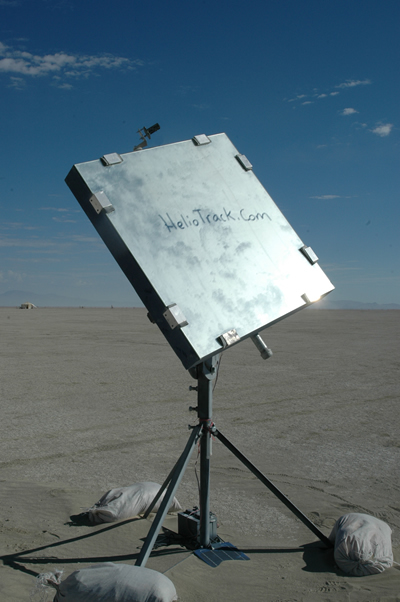 After an 80 Mph sand storm at Burning Man the heliostat is still tracking. It is clear from this photo that heliostat fields in the dessert present the real issue of dirty mirrors decreasing reflectivity and efficiency, just like in the movie Sahara. This heliostat is being powered by a small 12 volt garden tractor battery being recharged by a 5 watt solar battery charger. The dual axis solar tracking circuitry consumes only 8 milliamps of current , each actuator draws about 500 milliamps at 12 volts. In 8 hours each actuator operates for about 3 minutes tracking the sun and then returning to the morning preset position. On average each heliostat consumes about .2 watts. This suggests that a five watt solar panel could provide enough power for a field of 25 of these heliostats.